Provide comfort for the family of Ellen Coyne with a meaningful gesture of sympathy. Ellen E. Coyne, 73, a former resident of Bennington, Vermont and more recently of Bentley Ave. in Poultney, Vermont died Tuesday January 29, 2018 at the Dartmouth Hitchcock Memorial Hospital following a brief illness surrounded by her family. She was born in Bennington, VT August 20, 1945. She was the daughter of the late Earl and Mable (Campbell) Bishop. Ellen received her education in Bennington and attended Bennington High School. She enjoyed playing Bingo. Her family and grandchildren were her main interest. A celebration of Ellen’s life will be held at the American Legion Post 69 in Arlington, VT on Saturday February 2, 2019 at 2:00 p.m. 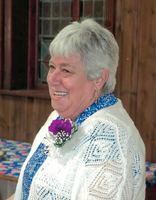 If friends desire contributions in memory of Ellen E. Coyne may be made to the Cystic Fibrosis Foundation through the office of the Mahar and Son Funeral Home 628 Main St. Bennington, VT 05201. To send flowers in memory of Ellen Elizabeth Coyne (Bishop), please visit our Heartfelt Sympathies Store. Provide comfort for the family of Ellen Elizabeth Coyne (Bishop) by sending flowers.